How are claims to justice formulated, invoked and confronted in relation to reports of mass human suffering? What notions of justice inform the scope and nature of official inquiries into harms and the responsiveness of governments to their findings and recommendations? Why, despite legal and public recognition of claims of injustice, does harm so often continue? This introduction to the Special Issue ‘Moving On’? 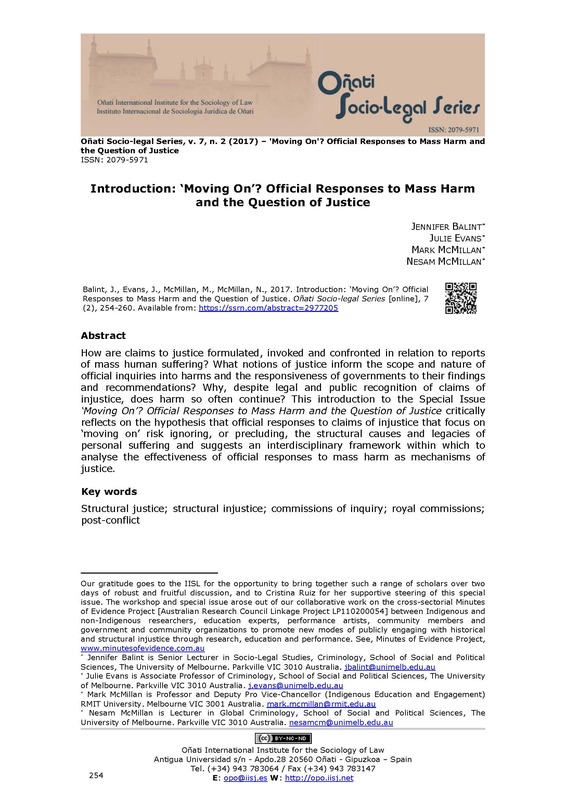 Official Responses to Mass Harm and the Question of Justice critically reflects on the hypothesis that official responses to claims of injustice that focus on ‘moving on’ risk ignoring, or precluding, the structural causes and legacies of personal suffering and suggests an interdisciplinary framework within which to analyse the effectiveness of official responses to mass harm as mechanisms of justice. Conducted by royal commissions, select committees and the newly established inspectorates, early Victorian social investigations elaborated formats and procedures of public inquiry that left an enduring impact on modern, liberal public spheres in the English speaking world and beyond. This article revisits a few features of 19th Century official investigations, highlighting the rather diverse and contradictory effects these fact-seeking ventures had on British democratic culture. I argue that even as government inquiries confirmed and strengthen social gradations as well as hierarchies of knowledge and expertise, they nevertheless allowed the British lower classes to participate in official discourse as knowers, not just sufferers, and opened new possibilities for dissent and contestations. I highlight the manner in which the investigation itself rather than any consequent legislation or policy touched upon the administration of justice either by emulating court procedures or in terms of its epistemic labor. In the last 25 years we have witnessed the rise of official apologies. These apologies can advance national reconciliation and justice for victims. They also require the introduction of other reparative measures to overcome the practical effects of past injustices and ensure against their repetition. Unfortunately, however, this is not how these apologies usually work in practice. As the article argues, state apologies function in a paradoxical way. In making apologies states seek to acknowledge and accept responsibility for past wrongs; at the same time, states use them to limit their liability. The apologies made in Australia and Canada to Indigenous peoples in 2008 will be examined in view of this analysis. Ultimately, the article argues that while these apologies seem to be addressing past wrongs, they have done little to change the status quo. In advancing these claims, the article emphasizes the importance of history to the apology-making process. This article reconsiders the role of forgiveness in the South African Truth and Reconciliation Commission (TRC). Following the preface, the article situates forgiveness within the Lacanian psychoanalytic registers of real, symbolic and imaginary. These dimensions of forgiveness are presented in dialogical style in order to reflect the spirit of dialogue and voice in accordance with which the TRC took place. Part 6 takes up the discursive problematic of forgiveness and submits it to the genealogy of the TRC as produced by Adam Sitze (2013). Drawing on Sitze, I offer a novel understanding of forgiveness, namely as a Foucaultian norm integral to a biopolitical imperative (here, the imperative of peace). In the concluding parts, I return to the psychoanalytic paradigm in order to consider whether we can nevertheless recognise a certain ‘surplus’ forgiveness in and around the TRC. Whether this may be the case in spite, or because of, the biopolitical deployment of forgiveness, remains an open question. During Argentina’s military dictatorship (1976-1983) more than 30,000 people disappeared including 500 babies who were stolen from detainees and given to military supporters. The Grandmothers of the Plaza de Mayo have been successful in lobbying for laws to reclaim these babies and make perpetrators accountable. This article explores one such law that made DNA testing on these now adult children compulsory. In drawing on Bourdieu’s notion of law as a symbolic discourse of power it considers how this law could establish an authoritative reality that, in some cases, was contrary to the interests and experiences of the stolen grandchildren. Finally, it argues there must be caution about legal responses that can have the unintended consequences of continuing similar harms of the past. Our paper argues that a move away from the linear approach adopted in transitional justice scholarship is required to the question of ‘moving on’, understood as the way in which a post-dictatorial or a post-conflict regime addresses the past injustices of the predecessor regime. We consider this question in relation to two case studies: post-dictatorial Albania and post-conflict Sierra Leone. Both examples point to important factors that underpin the meanings of ‘moving on’ and of justice, when analysed through a law and aesthetics lens. It has long been established that legal scholarship that makes use of works of art aids and clarifies the points that it wants to make. We examine the power of certain art forms, namely the way in which space ‘speaks’ and the narratives found in an image in the Albanian context, and the use of film to provide a deeper appreciation of the conflict in the Sierra Leonean context. Different aesthetic practices have been used as a way to respond to historical injustice and mass atrocity, also when partial justice (through the law) has been achieved. Our article argues that law’s limitations can be understood through the process of unravelling the pieces of the puzzle that make up affective justice. Artistic representation allows for a more complex narration than law’s linear demands.